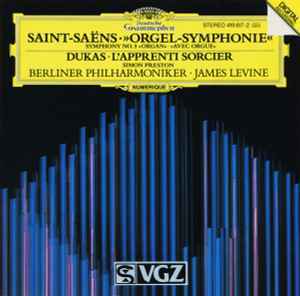 Reissue of Saint-Saëns*, Dukas* - Berliner Philharmoniker, James Levine (2), Simon Preston - "Orgel-Symphonie" · L'Apprenti Sorcier with the logo of Dutch Life-insurance company VGZ on the cover. Pressed by PMDC, Germany, dating it somewhere between January 1993 to December 1998. Contains liner notes and all titles in multiple languages. Recording: Berlin, Philharmonie & Jesus-Christus-Kirche, 6/1986. Publishers: Durand & Cie, Paris. Cover Photo: Volker Möbius, Neuenkirchen. ℗ 1987 Polydor International GmbH, Hamburg. © 1987 Dr. Michael Stegemann; Robert Orledge; Maria Kardos-Morin. Printed in West Germany by /Imprimé en RFA par Neef, Wittingen. Made in West Germany / Fabriqué en RFA. Sponsored by Dutch Insurance Company VGZ.